$35.00 In stock. Order in the next 19 hours, 28 minutes and it will go out today! 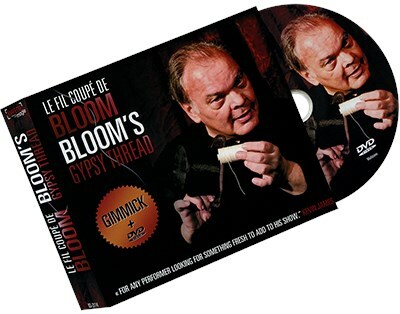 After years of jealously keeping it secret, Gaetan Bloom has finally released his take on the classic Gypsy Thread in this, Bloom's Gypsy Thread. Perfect for close-up, parlour and stage, Bloom's Gypsy Thread uses an original method to Bloom that solves in a remarkable way the problems usually associated with this effect. As a result, Gaetan has produced something so clean, so powerful and so mind-blowing that he personally uses it as the finale to his shows. For those unfamiliar with the effect, the Gypsy Thread is a classic. You take a length of sewing thread and cut it into small pieces (usually done by the magician, but in this version by the spectator). The pieces are then gathered together and rolled into a small ball and when unrolled, the thread has magically restored to one length. Fans of Gaetan Bloom will know the level of thought and detail that go in to his work, and Bloom's Gypsy Thread is no different. Your purchase comes with a DVD featuring the full explanation as well as the special gimmick that makes the magic happen.